Sometimes in life you are surprised by little things that mean a great deal you you. At least I am. I recently got a great little present. 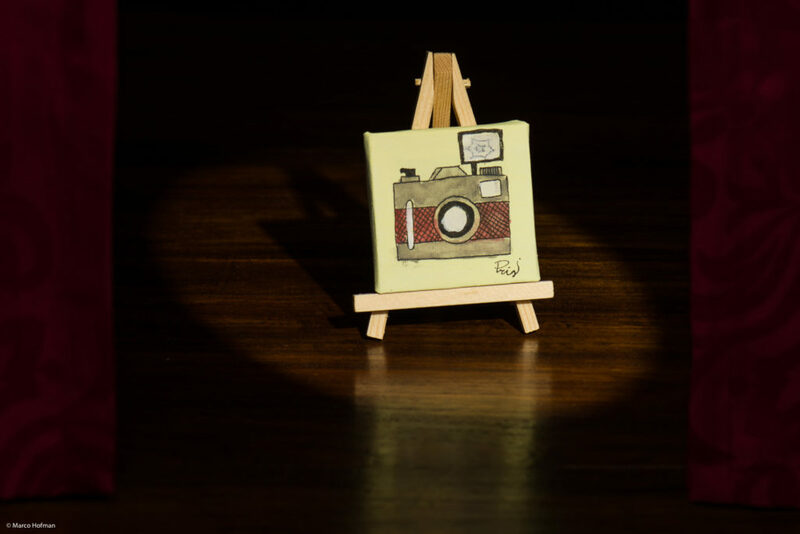 A mini painting which was created just for me. Signed and all by the painter. I love it. Not just the painting itself but also the fact that someone takes the time to create something for me. Well, the subject of the painting may be clear then. It’s a camera because, as you might expect, my big passion has something to do with photography. So this painting will get an place of honor in my office. But for my feeling that’s not enough. When I’m really touched about something, I like to ‘catch’ it somehow in an image. So I decided to make an image where this mini painting plays the main role. And recently I got a cool spot attachment for my studio strobes so why not combine both and test the spot attachment for this image. I had a dark ’stage’ in mind in which the painting is highlighted by a round circle of the spotlight. Like a followspot that is used during live shows to follow just the artist in a dark environment. For this shoot I used a small studio strobe with projection spot attachment as a main light. I used a medium sized aperture mask inside the projection spot attachment to create a smaller cirkel and focussed the light until the sharpness of the edge was to my liking. I used a standard studio strobe with a small octabox at the lowest power setting as a fill light in order to slightly light the ‘curtains’ and foreground. So hereby a big thank you to Priscilla for this great gift. I love it.